The Errand Prince is a Quest in Final Fantasy XV. 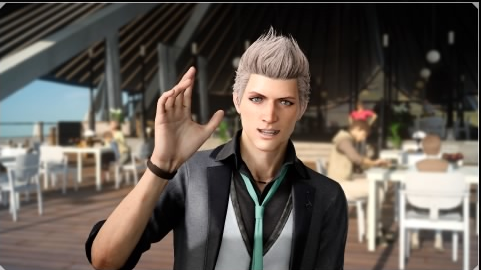 "Upon arriving at Galdin, a reporter named Dino immediately identifies Noctis as the crown prince. He promises to keep quiet and secure a ship if Noctis agrees to mine some rare gemstones for him." Head to the mineral deposit. While your party is trying to figure out your next move a reporter will approach you with an opportunity to help him in exchange for his silence. In this area you can also find a cat on the docks to begin the Kitty Catering Side Quest. Take him up and head north towards the map marker to find the mineral spot guarded by a fearsome bird. It's a formidable foe so stealth is probably the best option here. Sneak around its tail to the mineral spot, and head behind it to startle it letting you harvest the last deposit. Head back to the car and chat with Dino who will give you a Garnet Bracelet. You can mention the coin you got from the stranger. As thanks, Dino will get you a spot on the ferry. Take care of whatever you'd like to in the area and rest up for an XP boost. The ferry will leave the next day. Your journey will then continue in Ill Tidings.